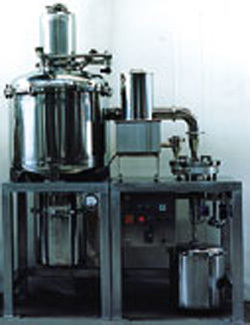 SuperJet microniser Kompak-3BP was the first machine for APIs ( Active Pharmaceutical Ingredients). In production since 1989, this machine was subject to continuous evolution in terms of versatility and compactness. It has been manufactured in several, different versions during the last decade. Kompak-3x Pharma version is sanitary, USDA-accepted design and in line with Good Manufacturing Practice and pharmaceutical specifications worldwide. It is equipped with JM3 SuperJet microniser that has replaceable nozzle rings with optimized grinding angles for different products or range of products. The microniser disassembles in more parts, without recessed surfaces, for perfect cleaning of components and fast changeover, without risk of cross-contamination. The dust separator is cylindrical and has sanitary clamp connections. The process equipment is made of stainless steel AISI316 (AISI316L) with hand-polished,pharmaceutical, mirror finish of product contact parts, 400-600 grit Ra 0.15-0.25µm. Materials, filters and roughness certificates are routinely supplied. The modular design allows customization and interchangeability of different components such as the product feeding system, the microniser, the product collecting bin and a wide choice of ( optional) process controls. Twin-shaft feeder, volumetric type, with concave-profile, self-cleaning, screws, able to break the agglomerates and to assure an accurate feeding of poor flowing products, for the whole batch. The feedrate is controlled by a stepless, mechanical, speed variator. High-efficiency, dust separator combining inertial and static effects. It is equipped with a membrane filter cartridge, reverse-pulse, automatic cleaning and final, safety HEPA that exhausts breathing air quality to the atmosphere. Standard controls, integrated in the front panel, include process pressure regulators, pressure gages and differential gages to monitor the filters. batch validation equipment including 4-20mA loop signals from pressure transducers and process recorder to document each event and alarm. vacuum compensation system that avoids environment contamination in case of blow-backs. replaceable internal linings include PTFE and hard-metal alloys, etc. All SuperJet Micronisers can be customized according to the purchase and the product specification.